Parents and students are invited to join us on Thursday, April 25 at 6:00 as our teachers discuss important information concerning our upcoming State Testing. Parents will become the student as they have an opportunity to participate in a practice test and get a glimpse of what the expectations are for their student. 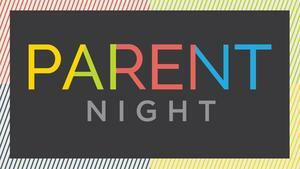 Parents will also learn how they can best prepare their students for their testing days. Pizza, desserts, and beverages will also be served. Please make plans to attend. Pageland Elementary will begin SC READY and SC PASS testing with 3rd grade students on Monday, April 29. Please refer to the schedule to keep informed of your child's testing days. You may call the office at any time with questions. The 2018-2019 school calendar has been updated to depict our make-up days due to previous inclement weather. Note that students return to school following Winter Break on Thursday, January 3. 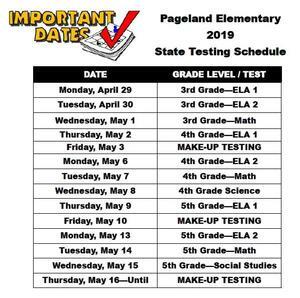 Pageland Elementary will be giving the SC READY and SC PASS tests beginning May 1 and continuing through May 17 (with any make-up tests to follow). Please ensure that students are present on the day of testing. Pageland Elementary held its 1st Annual "Real Men Read" event on Friday, January 26. Congratulations to our November Students of the Month. Congratulations to our October Students of the Month. These students were recognized for showing RESPECT on a daily basis. Pageland Elementary will be closed from December 18 through January 1 for winter break. Classes will resume on Tuesday, December 2.